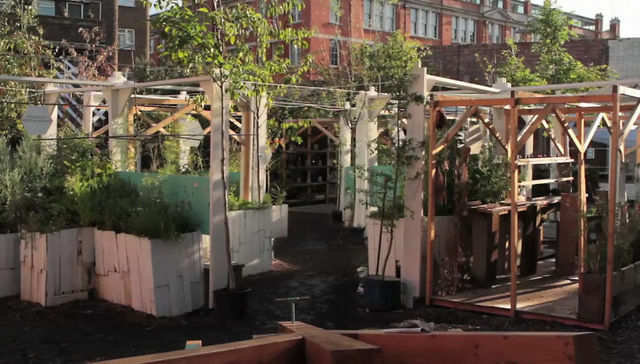 The Urban Physic Garden transformed the derelict site of Union Street once again into an imaginative pop-up community garden, this time shaped by the hospital and pharmacy, with a focus on medicinal plants and herbs that heal. Nearly 200 volunteers came together to build the garden, which organized plants by hospital ward in a series of garden rooms. Summer in the Urban Physic Garden was a festival of talks, workshops, film screenings and events. The garden provided a platform for artists, designers, gardeners and health practitioners from a diverse range of backgrounds and cultures. The garden was host to a range of invited artists projects, including the return of Oliver Bishop-Young’s ping-pong skip, Tom Foulsham’s wonderful Water Pipe sculpture, Anna Garforth’s moss pharmacy cross and a UK premier of the play-structures designed by the Serbian collective Skart, previously shown at the 2010 Venice Architecture Biennale. The physic garden was a place for lively debate – where people came together to explore the role of plants in science, health, well-being and the environment. The area of Southwark around the garden has a long history as a center for caring for London’s sick and poor – from Southwark Cathedral and the Old Operating Theatre to St. Thomas and Guy’s Hospitals. The garden serves as a case study for emerging plans to create a physic garden in one of the historic quads at the Guy’s campus of King’s College. Plans for a garden are part of proposals to develop public access to King’s Museum of Life Sciences, which is housed on the Guy’s campus.